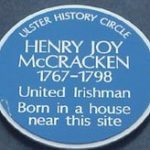 Henry Joy McCracken was born in High Street, Belfast on 31 August 1767. Proud to belong to two important Belfast Presbyterian families, he always used his full name. 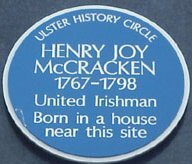 His father, John McCracken, was an entrepreneur and associated with many of Belfast’s leading philanthropic ventures; his maternal grandfather, Francis Joy, owned important paper mills and was the founder of The Belfast News-Letter. The Joys – of Huguenot descent – were also a public-spirited family. 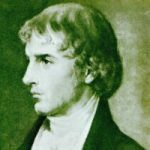 Henry was early interested in radical politics and used his position as owner of a cotton mill, of which he was put in charge at the age of 22, to travel extensively, making political contacts; he was always concerned with the welfare and education of his workers. 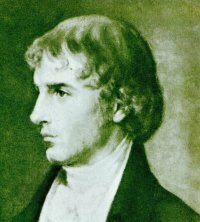 In 1791 he joined with Thomas Russell in forming the first Society of United Irishmen in Belfast. In 1796 he was imprisoned for over a year in Kilmainham Gaol, Dublin. When the insurrection broke out in June 1798, McCracken was made general of the forces mustered at Donegore, which then attacked Antrim town. They were defeated by government troops. After a month on the run McCracken was captured in Carrickfergus while trying to escape to America. He was tried for treason and hanged in the Cornmarket, Belfast, on the same day: 17th July 1798. His sister Mary Ann had a doctor standing by in case there was still life in the body after it was cut down; but in vain. McCracken was buried at St George’s, High Street, but the remains were later transferred to the Clifton Street cemetery. Location of plaque: At the site of the birth house, 37 High Street, Belfast.